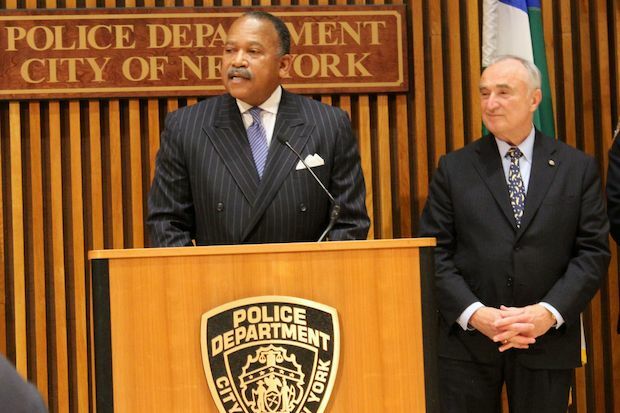 CITY HALL — Police Commissioner William Bratton and Mayor Bill de Blasio heaped praise Wednesday on Benjamin Tucker, the new pick as the NYPD's First Deputy Commissioner following Friday's abrupt resignation of Philip Banks III. But the response from politicians and community leaders has been lukewarm at best. Banks, the chief of department and a 28-year-veteran, had largely been hailed as the best candidate to heal the rift between the minority community and police over issues such as stop and frisk and "broken windows" policing, as well as to implement reforms won as part of a federal class action discrimination lawsuit against the NYPD. But Banks resigned Friday after he and Bratton could not agree on the scope of duties for his new job, sparking concerns among advocates and elected officials about diversity in the NYPD's upper ranks. While de Blasio and Bratton praised Tucker Wednesday as an "intelligent visionary leader" who has done "extraordinary things" on the city and federal levels, leaders including Rep. Hakeem Jeffries questioned the appointment. "Ben Tucker has an interesting background, but there is no recent evidence of any meaningful community-based experience," Rep. Hakeem Jeffries said in a statement. "Let's hope he will be successful, but the jury is out." The Rev. Al Sharpton, de Blasio's most influential and outspoken ally in the black community, was similarly tepid, saying he and Tucker "never worked closely together." "I hope to meet with him about my concerns for the need for police reforms and fair interactions between community and policing," Sharpton said. "I would hope those conversations lead to a candid and fruitful continuation of making the city fairer and safer." Retired NYPD sergeant Anthony Miranda, head of the Latino Officers Association of America, said the quick choice of Tucker smacked of tokenism. Miranda added he was concerned Tucker was picked mainly because he's African American. "Chief Banks had an established history of working with the minority community. Tucker does not have an established history. You can't even make a comparison because their backgrounds are night and day," said Miranda. "They had the audacity to not even interview or consider a Hispanic candidate," he added. "How do you make this appointment when this is supposed to be an inclusive administration?" His group also raised concerns when the former first deputy commissioner, Rafael Pineiro, the highest ranking Latino in the police department, resigned in September. Angelo Falcón, president of the National Institute for Latino Policy, said the pick is not going to win de Blasio any friends in the Latino community. His group has been leading an effort called a "Campaign for Fair Latino Representation." Despite making up a third of the city and 25 percent of the city's civilian workforce, Falcón said his group has calculated that only 12 percent of de Blasio's announced appointments over the last year are Latino. "This is a so called progressive mayor and he has a blind spot when it comes to the Latino community," said Falcón. "The way this appointment was done comes off as a political response, adds to cynicism about the process and questions the sincerity of the mayor when he says he wants to make his administration diverse."